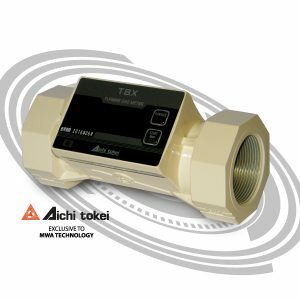 The Aichi TBX low pressure drop range of gas turbine meters was developed by Tokyo Gas Engineering to control and manage gas flow into gas burning appliances such as boilers, furnaces and burners. The TBX meters are ideal in factories and laboratories as they are suitable for a wide range of general gas applications. Alongside its versatility and ease of installation, the TBX turbine gas meter is extremely sensitive, picking up the very slightest flow of gas and measuring it to the finest degree of accuracy with minimum pressure drop. 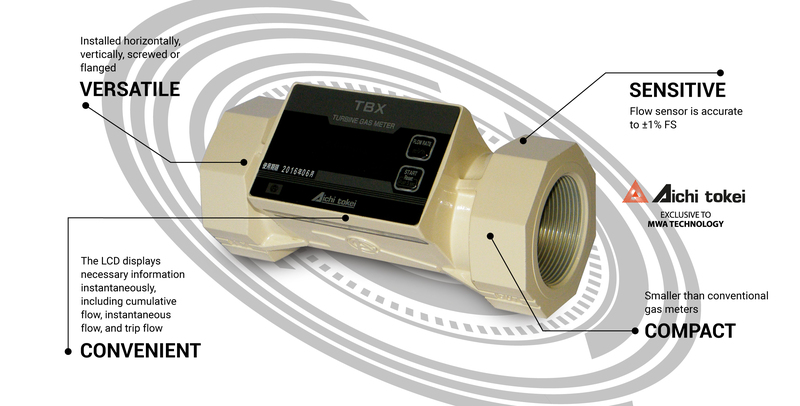 The TBX turbine gas meter flow sensor is accurate to ±1%FS. This precision in measurement and sensitivity makes the TBX the perfect component to fit in factory instrument systems where the control and management of gas flow is paramount. The optimum for energy management, your TBX meter will pick up the very slightest change, so you can have absolute confidence in your system’s performance. The LCD indicates total consumption, trip flow and instantaneous flow rate ideal for adjusting boiler air to gas ratios. One of the first things that you’re likely to notice about the TBX is its size; being much smaller than conventional gas meters, the TBX is light, compact and stylish. But don’t let that size fool you! The effectiveness of the TBX turbine meter is well distinguished. The smaller size means money saved for you but without sacrificing performance, even with an ultra-low pressure drop. The TBX can be installed easily in a variety of ways; horizontally, vertically, screwed or flanged. It can handle a wide range of gases, not only town gas but LP gas, air, nitrogen and more. It also needs no external power source, as the built-in lithium battery lasts for 10 years of non-stop operation. There are several variants of the meter, depending on your needs – maximum pressures of 1.0, 3.5 or 9.9 kgf/cm2, and maximum flow from 30 to 300m3/h. The TBX contains two independent pulse oscillators which allow remote meter reading and connection to a computer, meaning that you can operate a thermal management system without needing to be in close proximity to the meter itself. Its LCD flow rate display can display necessary information instantaneously, including cumulative flow, instantaneous flow, and trip flow. MWA is proud to stock TBX meters, delivering them anywhere in the UK within 24 hours when ordered before 4pm. Contact us to learn more about how the TBX can suit your metering requirement or order it directly.